Fron GoF Attach additional responsibilities to an object dynamically. Decorators provide a flexible alternative to subclassing for extending functionality. Despite what the GoF book says, subclassing is a part of Decorator but is very much reduced. As an example in the diagram above, 'Component' could be Control, 'ConcreteComponent' could be TextBox, Decorator would be TextBoxDecorator, and the 'ContreteDecoratorX' classes might be BorderedTextBox, NumericTextBox, DateTextBox, FlashingTextBox, etc. The point of Decorator is that it allows you to combine the Concrete decorations without further subclassing: by combining the decorations you can get a bordered, flashing, numeric TextBox. Other possibilities are decorating a custom control to include a ListBox, a variety of CheckBoxes etc. This is the main point of this Pattern. It prevents an explosion of subclasses. We have one concrete class (Circle) and two decorators. This gives us a total of 4 possible styles; three decorators would give 8 styles; four decorators would give 15 styles; and so on. This is potentially a huge saving in complexity and maintenance costs. As an extension of the example above, note that the boxed circle uses the base circle's size and draws its box to that size. If it enlarged itself and drew its box just outside the circle then it could be applied twice: this would draw a circle within a box within a box. Thus the same decorator can be applied multiple times. 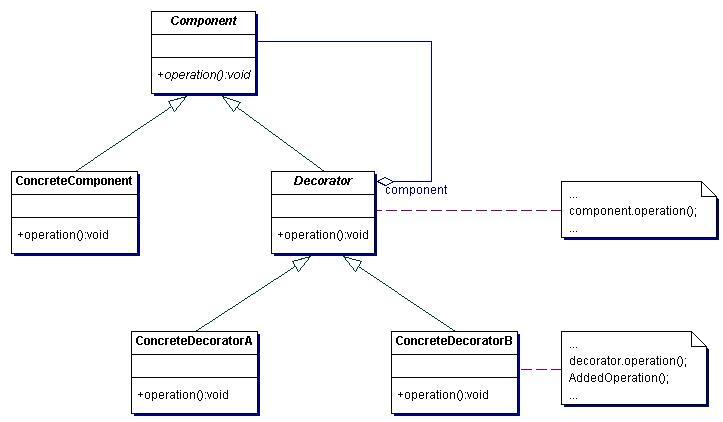 In the canonical example � with an abstract Decorator inheriting from a superclass of the object to be decorated � the decorator is not coupled to the decoratee. In the circle example I have given, the decorators are coupled to the decoratee, which is not necessarily ideal; the boxing decorator could be used far more generally (it would have to use a different method to find the extent of the box to draw, but that's trivial), however drawing a cross right through the middle of many controls is probably not a good idea so it may be sensible to couple this decorator to something specific. Smart Pointers in C++ are decorators which count references. The .NET Framework has a number of classes which have a Synchronized method. This method returns a thread-safe version of the object. This appears to be done by decorators (it is in Java). A Collection class can be decorated to sort the contents in various ways. For instance, a Hashtable has no direct way to either use foreach to iterate over its contents, nor to sort them. Decorators can be applied to do either of these and applied in series to do both. Streams can be decorated to provide various pre- and post-processing operations such as compressing, converting to/from ASCII and Unicode, and so on. Decorator should be used where an object has a number of optional extras, and these extras may be added ad-hoc in any combination. A subject and its decorators are decoupled. The author of the subject does not need to do anything special for it to be decorated. Similarly, decoratees do not need to prepare for being decorated. It is easy to add any combination of capabilities. The same capability can even be added twice. This is difficult with inheritance. The same object may be simultaneously decorated in different ways. Clients can choose what capabilities they want by sending messages to the appropriate decorator. Objects do not pay for capabilities they do not use. Thus we have efficiency and generality at the same time. Delegation may be required for self calls to work properly. If the subject class is heavyweight, with lots of data or methods, it may make decorators too costly. Instead of changing the skin of the object, you can change the guts, via the Strategy pattern. Strategies do not have to conform to the subject's interface. The Strategy pattern can always replace the Decorator pattern, but it requires more anticipation. The Decorator pattern requires virtually no anticipation. Sometimes objects need to call themselves or pass themselves to other objects. What should the subject do in this case? Should it pass itself or the decorators? If it should pass the decorators, then it needs to have some way of knowing about them. (Note that the Strategy pattern doesn't have this difficulty.) One way is delegation, where the decorator passes a reference to itself when it forwards the request. That way the subject knows who was the original recipient - but then the subject must know it is going to be decorated.